From USA Today Bestselling author Jessica Scott comes an all new novella about a woman who came back from war changed and the man who loves her enough not to let her go. This story has been featured in Home For Christmas: A Holiday Duet with JoAnn Ross. I truly enjoyed reading "All I Want For Christmas Is You"! I loved the fact that the character that had the 'issue' was the heroine and that the hero was the one that was supportive and determined to keep them together! LOVED Patrick!! He tugged at your heart and made everyone with a significant other turn to theirs and say "Ahem! "Samantha broke your heart and made you want to give her a hug and be there for her. And adorable Natalie made you want to bake cookies and pour two glasses of milk and listen to her tell you about her day! An amazing series that continues to grab readers and pull them into the lives of these characters. 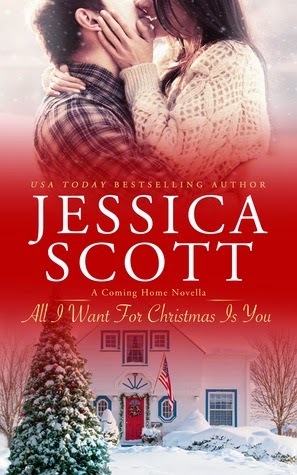 Jessica Scott, the author, has a fantastic ability to make the characters real and have the readers fully engaged in what they are going through. The reader will befriend each characters and root for them until the very end. I received a complimentary copy of the book from the Author, Jessica Scott in exchange for an honest review. This review is my own opinion and not a paid review.